Download the free PDF from the CDC website. This book was the dream job of the century. An obscure subject for some people, but definitely of interest to the dairy industry—farmers, processors and bureaucrats alike. They say the mind has a short memory for pain, and believe me, there was pain involved in this project. But as one friend noted near the end of the journey, 300 days over a two-year period, she had never seen me as happy as when I was writing this book. Do what you love and you’ll never have to work again, as the axiom says. And I even got paid! Tackling a corporate history book project: Not for the faint of heart! Tackling a corporate history book project: Not for the faint of heart! 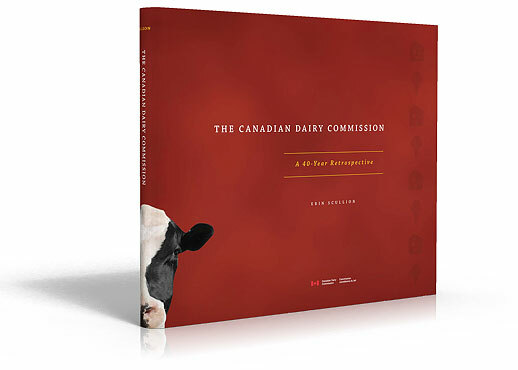 There were a number of defining moments during the two-year period (300 working days, to be exact) that I had to research and write the history of the Canadian Dairy Commission. And did I mention reflecting the perspectives of government, consumers, farmers, processors and further processors? Oh yes, and the impact of international trade rules and trends? And that the majority of the work involved facts, which had to be verified or factchecked against more than one source? Another defining moment was when, after three months of the job, I actually sat down to start Chapter 1. I remember feeling sick to my stomach. And I thought to myself, “That’s it. I can do this. I’ll chunk it down. I’ll do it decade by decade, chapter by chapter, heading by heading, issue by issue.” I took a deep breath and starting writing. Over 100,000 words, 500 footnotes and two years later, I handed in the final draft of the manuscript. A launch party was held on Feb. 15, 2007 at the Canadian Museum of Civilization in Hull. And yes, once I finally had that puppy in my hot little hands, I felt all the pain had been worth it. The term “blood, sweat and tears” does come to mind, though. I chewed my fingers (a lifelong habit) until they bled, getting blood smears on many and various pieces of paper, I sweated as I worked through the pain of a newly herniated disc in my lower back. And I did occasionally shed tears, mostly from fatigue. But to be honest, if I had it to do over again, there aren’t a lot of things I would do differently. Still, I have a few dos and don’ts, well, only one don’t for my next book: I would not commit to completing a history book in a set time frame unless it was really long and the schedule was flexible! Why? Because it’s too hard to estimate how long a manuscript might take you. How do you know what the expectations are? How accessible is material you’ll need to consult? How long will it take to find and get it? Who are the people you need to interview? Are they alive? Can you find them? Can they talk? And how reliable are their recollections? I was lucky with the CDC. It had good on-site archives and lots of good corporate memory still around and in Ottawa. Depending on how big and complex a history was contemplated, I would ask to do the project in phases. If everything’s on track: everyone’s agreed on the direction the project is taking, and a good working relationship and trust have been established among all parties involved, Phase 3 would be to set a reasonable time to complete a chapter, keeping in mind that there will always be things you’ll need to backfill later. Once the first chapter is complete, you’ll have a good idea of how much time you’ll need for the rest of the book (but prepare for the unexpected) and then you can plan the schedule for finishing. I would plan more time for revisions. Because I was under the gun for time, I estimated revisions would equal about 25 per cent more time than the writing of each chapter-50 per cent would have been more reasonable. In fact, I probably needed as much time for revisions as I did for writing, considering the breadth and depth of material covered. I would create a database for my notes. I pretty much typed all my interviews into my portable in Microsoft Word and filed them by date and interviewee. The system worked for me (I had 130 interview files, which I printed out and highlighted) but I would be more systematic and methodical now about my note collecting. I did not tape interviews because I knew I wouldn’t have time to transcribe them. I would have a clause in the contract about extenuating circumstances for extending the timeframe. Chapter 4 of the book, the 1990s, for example, was twice as long as all the other chapters. And there were some heavy-duty research and a lot of conflicting information to sort out. There’s no way I could have known that beforehand. I made a case for extra time, and got it with no problem from the CDC, but they could easily have refused and I would have been on the hook for extra work with no pay. I would definitely ask for a part-time research assistant. The CDC hired a law student and handed her over to me for two summers and part-time work during the year between. She was a godsend! And a crackerjack! Sarah Speevak, I love you! I would definitely ask for an advisory committee, made up of a cross-section of people involved in the Commission’s history, especially people with a keen interest in history and time on their hands (often retirees). The CDC History Book Advisory Committee was a phenomenal resource and source of support. I would take on a project only if I knew I would have a lot of autonomy. One of my favourite sayings about the CDC history book project is, “What was wrong with the project, it went so well?” The CDC asked me to do a job, opened all doors, and then stepped out of the way and let me do it! How great is that? !